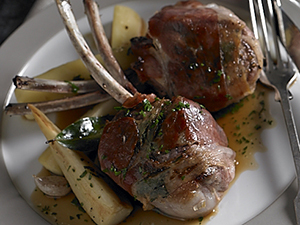 Double lamb chops make an impressive entrée, especially when the preparation is a few steps up from broiling or grilling. Chef Stefanelli wraps the chops with prosciutto before sautéing and separately roasts the trimmings from the chops. These are roasted with garlic and shallots as the base for a flavorful jus; lightly browned parsnips complete the plate. Although lamb racks are a more expensive cut, these extra elements add enough value and finesse to the dish to justify a higher menu price. In heavy-bottomed pan or Dutch oven, combine lamb trimmings and garlic; roast at 425 F until garlic is golden, about 15 min. Transfer trimmings to plate; set aside. Add shallots to rendered fat and garlic; roast until shallots are golden, about 10 min., stirring occasionally. Remove pan from oven; transfer garlic to plate with lamb trimmings. Place pan on stovetop over med.-high heat. Stir in wine, using a wooden spoon to scrape up browned bits from bottom; simmer until wine is reduced by 2/3, about 2 min. Return roasted trimmings to pan, reserving garlic for later. Pour water over trimmings just to cover; bring liquid to a boil. Reduce heat to med.-low; simmer 45 min. Turn off heat; strain jus through fine-mesh sieve into med. bowl and set aside. Bring large pot of salted water to a boil. Fill large bowl half-full with ice; cover with water and set aside. Remove parsley tops from parsnips; remove leaves from stems. Discard stems; set leaves aside. Peel parsnips; blanch in boiling water 2 min. Transfer to ice water bath to stop cooking. Transfer parsnips to towel-lined sheet pan; set aside. Place chops on another sheet pan; season both sides with black pepper. Place a few parsley leaves on top of each chop; wrap a piece of prosciutto around each chop so seam is on underside and meat is completely enclosed. (Do not cover the bone.) Finely chop 2 tbsp. remaining parsley; set aside. Lightly coat large skillet with nonstick cooking spray; heat over med.-high heat. Add chops, parsley-side down; cook until browned, 6 to 8 min. Turn chops over; add butter, bay leaves and reserved roasted garlic. Cook until chops are browned, 6 to 8 min; turn chops over and cook to med.-rare, about 8 min. longer. Remove chops from pan; cover and set aside. Place blanched parsnips in drippings in pan; brown on all sides, about 8 min. total. Pour in reserved lamb jus; bring to a simmer. Reduce heat to med. ; simmer 1 min. Add chopped parsley. Serve parsnips and jus alongside chops.